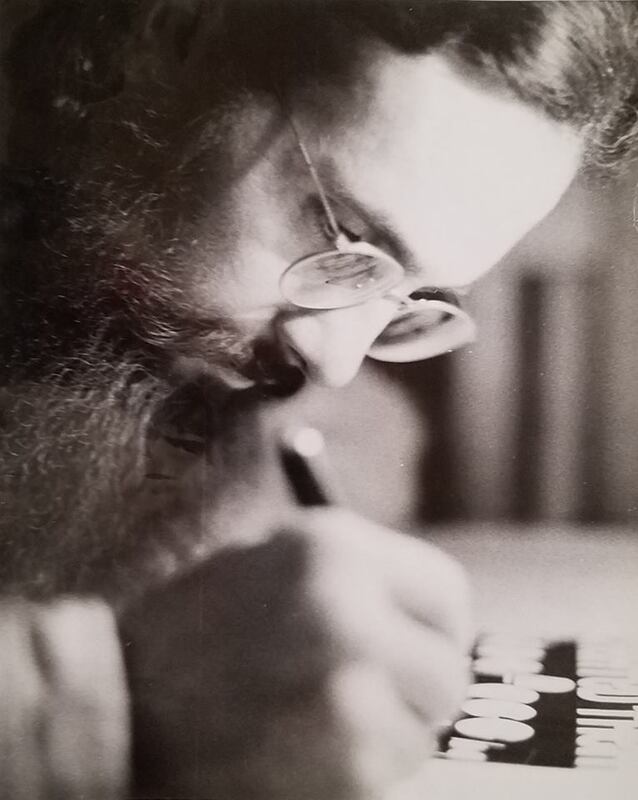 I started designing type faces in 1962 as a Sophomore in High School, here in my hometown of Crosbyton, Texas. A girl named Sandy Kendrick who lived a few miles from me out in the country near the Mt. Blanco farm community, loaned me her Speedball book of hand-lettering. I used to write kids names in Old English for 25 cents during class. My first printed job was the lettering for the local First Baptist Church Choral group. 1964 to 66, went to CIA, Colorado Institute of Art. Did lots of lettering, even using a compass with ink pen lettering Roman Faces. In the Army, 1967, while on "maneuvers" I designed my first published face, Joe Taylor Farmhand. I carried two sketch books with me hidden in my tee-shirt and black marks-a-lot pentel pens, so I could draw all the time when we were at ease. In 1967, I went to New York with my Farmhand design and Mergenthaler Press published it. My folks had moved to Grinnell, Iowa, so left New York for Iowa. Working on high rise grain elevator construction and driving a farm tractor till it was too cold, I got busy designing School Bus and some other faces and sent them to Paul Bailey in Los Angeles. He offered me a job designing new type faces and cleaning up older ones for re-publishing. Joel Peck, designer of Joel Bold, came with me. Later I worked for Bob Trogman doing several faces, the most famous was Blippo Black. I also cleaned up and re-drew old faces like Advertisers Gothic from the 1800s. I also re-drew the logo for the motel chain, The Sheraton. Bob only paid me $400 for all of Blippo. Not much for such a famous face, but in 1970 $400 for a weeks work was not bad. He should have given me the standard contract of 25% of the gross for 10 years. Eventually, I left Bob and since I had not gotten a royalty check for any of the faces I designed, decided to not do any more for him. I talked to the guy in New York who invented "rub off lettering" sheets. He was gonna print my faces and I planned to sell them to art stores. But he needed $10,000 and I couldn't come up with it. 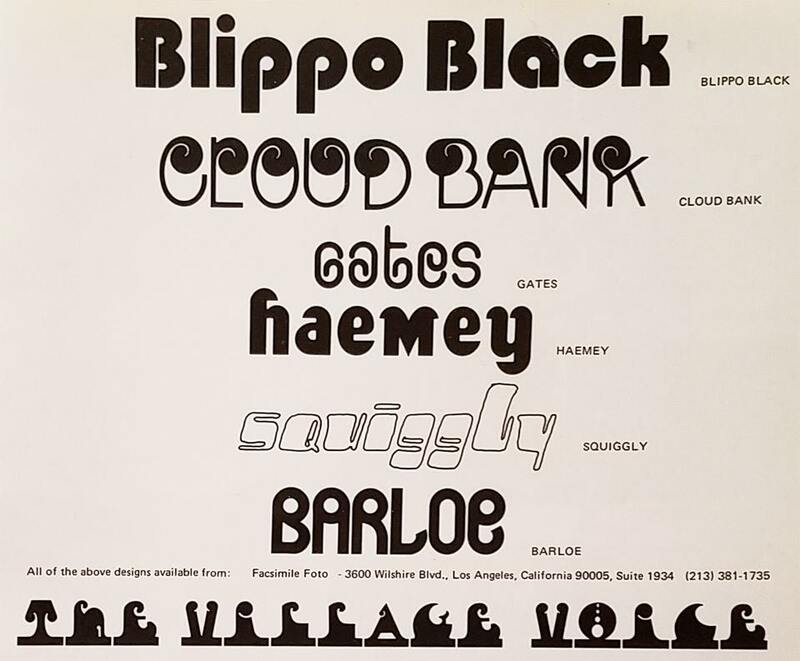 I planned to do a new version of Blippo and call it RIPPO BLACK like Bob did when he ripped off the original designer of the Jolly Roger face. I did several type fonts for banks and the like, but they were only used for their logos. I did lots of headline lettering for products, ads, posters etc. Several rock groups like the Beatles, The Who, David Bowie, Lynard Skynard, Mel Tormaine and many others used my lettering on their albums. When I was in Peru a few years ago researching the Elongated skulls, I saw Blippo everywhere on signs, store logos, posters. It even showed up on a van in Turkey. I designed a not-very-good face called SQUIGGLY and some guy contacted me a few years ago and said he had bought it. Must have been from Bob. Since I never got any royalties on it or any others, I wonder what the legal ownership is? Joe Taylor lettering with a Rapidiograph pen, Hollywood, California about 1971. 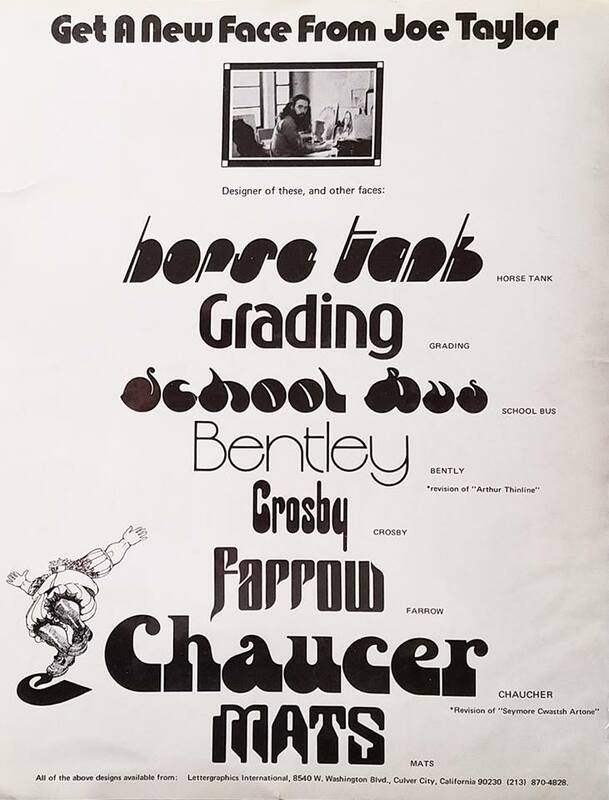 Page from Joe Taylor's flyer of some of his type font designs sent to art studios and advertising agencies in Los Angeles, California 1972.